SAN JOSE — The grand opening of a new exhibit, “Twice Heroes and More,” will take place on Saturday, Jan. 17, at 1 p.m. at the Japanese American Museum of San Jose, 535 N. 5th St. in San Jose Japantown. • Katsumi “Kats” Hikido (Campbell), who injured both legs in a land mine accident while serving in Europe with the 442nd Regimental Combat Team. • Buster Ichikawa (San Jose), who was wounded in Italy near the end of the war in an attack that killed soldiers behind and in front of him. 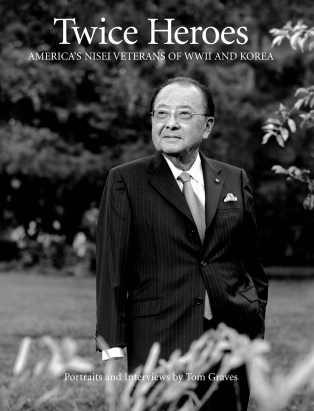 • Tak Ota (Gilroy), a Military Intelligence Service veteran who lost his uncle in the atomic bombing of Hiroshima. • Leo Oyama (San Jose), who served in France and Italy with K Company of the 442nd. • Frank Shimada (San Jose), who was wounded by a grenade while serving in Europe with the 442nd. • Hiroshi “Terry” Terakawa (San Jose), U.S. Army corporal in the Korean War. These six portraits, along with 14 others handpicked by Graves from his collection, showcase veterans from Northern California, including Lawson Sakai, recipient of four Purple Hearts and a Bronze Star medal. In addition to Graves’ photos, the new exhibit will feature five customized GI Joe dolls by Rian Ebesugawa, first vice commander at the Nisei Veterans Committee (NVC) in Seattle, where many of his Nisei soldier dolls are on display. Four new dolls, made especially for JAMsj, will be gifted to the museum: a soldier in World War II dress uniform; one in 442nd battle gear; an MIS soldier; and a Korean War soldier in winter battle gear. The fifth soldier doll is from the private collection of Tosh Yasutake. It is one of the very first made by Ebesugawa and represents a World War II medic, modeled after Yasutake. The exhibit also includes various artifacts from the featured veterans and the JAMsj collection. On display for the first time will be a scrapbook containing many of the poignant letters Nisei soldiers wrote back to members of the Crusaders will be shown for the first time. The Crusaders were a group of young women in the confinement camps who wrote to Nisei soldiers to boost their spirits. The group was organized by Mary Yuriko Nakahara, who later became a civil rights icon, perhaps better known under her married name, Yuri Kochiyama. The grand opening will include a special Q&A with some of the local veterans featured in the exhibit. Light refreshments will be served. RSVP to [email protected] or call (408) 294-3138 to reserve a spot.